Together in the Watchtower tower, Oliver wants to be Batman while budding ace marksman Chloe doesn't want to talk about why they haven't told anyone about the pregnancy. It's not every day Chloe dies, after all (including today), even a Chloe from a parallel universe. Westbound over the Atlantic Ocean, meanwhile, Bart tells Clark about the demonic creature he has been seeing while using his superspeed and how it started when he was trapped by Lex in that cage and forced to run incessantly lest he be electrocuted. Getting Clark to race him around the world, he says (see "Haunted -Part 2"), was a test to see whether Clark could also see the creature and, thus, whether he is "crazy." Clark assures him he isn't and commits to finding a way to confront the creature. Meanwhile, Lois, convinced Lex is up to no good, is investigating an abandoned Luthorcorp industrial site (the one that held Bart five years before), which has apparently remained demolished and unreclaimed all this time. At the site, where Lois has just arrived, a cleanup crew finds some kryptonite, the smashed glass walls of Bart's old cage and some weird red, yellow and black crackling energy on the ground. One of the crew members, a man in his thirties or so, bends down to investigate and is swept into (and then right back out of) a kind of multi-colored-energy cyclone. Lois yells for somebody to call an ambulance and then rushes to help. But the crew member is dead... and also an old man! Story - 4: Well, we got a bunch of information in this episode, some of it baffling, a little bit of it cool, and most of it neither. Let's start with the baffling stuff and get it out of the way (it's going to take longer, anyway, trying to figure it out). Then cool stuff, then conclude. Everything else is "neither." It's not that I think Chloe shouldn't be able to develop proficiency in her own husband's most lauded skill, but a couple of details in particular would seem to betray that this marksmanship business is not likely to be all that critical to future developments. Accordingly, if that proves to be the case, my question is why do it? Why suggest she's been spending a lot of private time firing arrows and darts into that target if nothing is going to come of it (which by nothing I mean development of her character in such a way that also develops the world and, if possible, contributes to Clark's story)? To me it seems just a half-clever way to play on the arrow motif (since Oliver is there, in which case, ok - maybe not optimal for Chloe, but I can appreciate the literary effort) while also granting Chloe a House, M.D. kind of moment (she is supposed to be brilliant, still, isn't she?) wherein an epiphany emerges from an at-best-laterally related event (that's the House part, not the second and final part coming up) in order to advance a completely unrelated plotline. Here are the details I mentioned: (1) Oliver plainly doesn't know how good she's gotten, which suggests his role has been slight, which undermines the development's likelihood; (2) Oliver takes the bow and arrows away from her and puts them back in his Green Arrow room in this bizarrely silent sequence that fails to convey whether she had chosen to stop practicing or he didn't want her messing around with his gear... or, what?... it just sort of happens, unremarked upon by either of them while I just... well, still, what? What was that? But, most tellingly, while this is happening (while Oliver is seemingly confiscating and storing the bow and arrows), Chloe gives voice to an extraordinary non sequitur: they had just been talking about why they haven't told anyone about the pregnancy goes from a flip remark about how they'll tell people before the child is old enough for college, to entreating Oliver just to let her "perfect her aim" with the bow, to this: "It isn't every day your doppelganger from a dead parallel earth drops by to warn you that 'The Crisis' is coming." Naturally (or, rather, unnaturally), Oliver doesn't miss a beat and is all like "Shame we can't ask her" where I'd instead be "Uh, what on either Earth 1 or 2 does that have to do with when we tell Lois and Clark about our baby???" Because, well, what does the bit about the doppelganger and The Crisis have to do with telling people she's pregnant, or, for that matter, with her newly revealed archery abilities? You could argue it goes to her psychology or something (that she's so traumatized about this death [it's not the first time she's experienced her own death, by the way, remember] she can't bear to talk about the new life inside of her? ), or maybe you could go back to whatever she saw (but we haven't been let in on) in the Helmet of Nabu (unless it's the pregnancy itself, which is where my money would go if I was any kind of gambler and there was an active wager on this... ahem), but there's nothing about this scene to suggest that Chloe is disturbed or unsettled or uneasy in any way - the way she was shown to be in issue 16 (really the last time this thread was in the narrative forefront). Very much to the contrary, the new archery ability shows us she's got herself quite under control. Let's also not forget that Chloe made an almost identical remark to this one, again in issue 16: "My doppelganger from a parallel Earth died right in front of me. I think I'm allowed to be a little on edge." Notice the difference? There, she connects the doppelganger dying to her behavior in the present moment, where Oliver had just noted that she sounded like the news she got from Emil (that S.T.A.R. Labs may have found a way to access the black box from Chloe-2's ship) was bad, as opposed to the good news it sounded like to him. Never mind that in both cases it plays like Chloe being rudely defensive is ok (cue the jokes about Oliver being "whipped"), here in episode 29 the distance between "when to tell people I'm pregnant" and "my doppelganger died" is so great and lazily bridged it can't possibly be serving any function other than to get the conversation/scene, by the time it's over, to The Crisis. Because who needs round characters when you have a plot? A plot, I tells ya!!! Meanwhile, what becomes of Chloe's mad marksman skillz? The scene ends on her, having seemingly lost Green Arrow gear privileges (or maybe not), throwing a dart into the dead-center bull's-eye, which she hadn't managed with the bow, looking on at the accomplishment intently as she responds to Oliver's background lament that they can't ask dead-Chloe what The Crisis is: "What if we could?" she asks (or maybe not - whomever it is that does ask that question is out of frame, but I'm going with the implied logic and assuming it's her). So now we have an implication of the direction in which this plotline is about to go (inter-dimensional time travel, obviously... Ha! That or, I don't know, zombie hypnosis? ), but what did the archery add? This is not about whether Chloe could or could not develop the proficiency on display in this issue. It's about what having her demonstrate this proficiency, pretty much out of nowhere, does for the story. And near as I can tell, it's "Face it, House, you're amazing!" Which, you know, as far as that goes (with the egregious exception of the brutal non sequitur), it's executed well, reaching its own little climax on a silent bull's-eye (rhetorically equivalent to Bingo!, I'd say) just as she has her epiphany about The Crisis (presumably, which I find I say a lot in these reviews... must be the weekly format... ). But it's also one-dimensional, near-shark-jumpingly bad for suddenly giving Chloe evident depth in a totally new skill and in a way that has neither intra-textual precedent (that I can recall, but if there is one it would help give some shape and scope to her potential) nor, seemingly, any clear world-building utility that wouldn't be totally jumping el sharko. Well, but then, you know - "That's so Smallville!" Oh and, yeah - down there in the subtext, it also emasculates Ollie (cue those jokes again), the more so since he seems to be completely oblivious to it. Some people will try to tell you it's just Smallville staying true to itself, but by at least Season 4 I was already past fed up with the series' penchant for the soap opera of constant secrets and lies upon demands for truth upon lies upon quadruple standards upon secrets. Here, Chloe and Oliver are telling a lie of omission to everyone they know, though I think if it's me I let this one pass because of the highly personal nature of the situation and because, well, it's still very early in the pregnancy and it's usually early in pregnancies that pregnancies are lost. In other words, it's not at all uncommon for women to refrain from issuing announcements of this sort until they are certain they will be carrying the pregnancy to term; however, it strikes me as conspicuously uncommon for Chloe to be this tight-lipped with Oliver. Perhaps something else is afoot here. And it is. It's not just Chloe and Oliver not telling their friends about the pregnancy (which, like I said, yeah, I'd be the same, even though, look at it, a secret/lie is the subject of their conversation and thus right there in our faces), it's Chloe keeping something from Oliver. See again in issue 16, that scene where not long after she admits her lingering edginess at having watched Chloe-2 die, Chloe(-1) and Oliver hug and we see the scene from behind Oliver, full witnesses to the distress on Chloe's face. Now, showing us that distress in a way that also shows Oliver not seeing it is one way to say: "He doesn't know how upset she truly is." Right? Are we all together on this? At the time, I speculated on untold Helmet of Nabu ramifications, but now that this thread is back, it seems... well, not exactly clear but clearer. I.e., she's got a secret. So what is it? We've speculated Helmet of Nabu - and I suggested just paragraphs ago that might have something to do with the pregnancy, which I'll say now that I think that has potential. Trauma from the Chloe-2 death can't be it because she's acknowledged it with him. What else? Because my thing is, once you establish that she's not entirely at ease, there's a difference between what she's uneasy about and why she's uneasy about whatever it is. As the audience, we don't know either of these things (again, it's not the death of Chloe-2, even if that's all we've seen her say about it - at most, surely, the Chloe-2 death is a sign for something else, whatever it is that's actually "haunting" Chloe) and, for my money, it's a more impactful mystery if we had certainty about one of them - in this case, why she's uneasy (e.g. ramifications of Nabu: pregnancy is going to miscarry? ), leaving us to wonder about (in, again, the Nabu case) just what exactly she "saw" and when it's supposed to happen. This is peculiar in a way that makes me doubt my own senses. When the matter is introduced via non sequitur, as I already explained, it's pretty much impossible for me to accept it as characterization. The artifice is simply too naked. Am I supposed to care why she keeps bringing up the experience of seeing Chloe-2 die for its own sake or accept it as evidence of post-traumatic stress? Or something else altogether? I'd like to be able to say but, even though Smallville's job - any narrative's job - is to leave me no choice, instead, here, it leaves me nothing but. The Lois scene itself feels very much like a Smallville Lois scene, so I have to give it props for that, even if it was the slightly annoying Lois who argues with whomever's around even if they are only peripherally involved in, or even aware of, whatever she's arguing about. Everything but some of the boldfacing in the dialogue ("When LEX [hammer] tortured you for stealing LUTHORCORP SECRETS [head]." 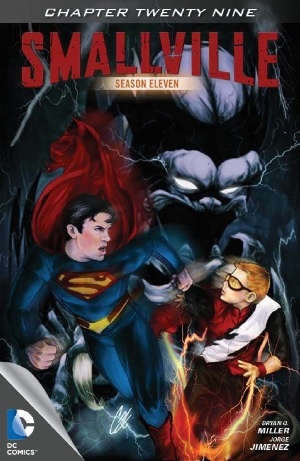 and "getting eaten by the Ghost of Christmas Speed" - the single worst Dickens subversion I've ever seen and, for that, a truly weak way to evoke "Homecoming" from Season 10 -, everything else in the flightbound recap exposition scene between Supes and Impulse does its job connecting with the past perfectly well. Alright, already, right? Yeah, ok. I'm much more genuinely interested in the Bart plotline than I have been in I think any other thread this whole "season." As much as I wish they were past the flashbacks at this point, still it intrigues me. I couldn't care less about almost everything else at the moment - Lex+Tess, Chloe's baby, Oliver's shrinking manhood (at Batman's, um, hands as much as Chloe's) and let's never forget the long-forgotten TELEPORTATION SUIT. Art - 5: Yeah, I like what this Jimenez guy is doing and I hope he sticks around for a while. Cover Art -4: Man, this new cover totally calls to mind the original Hardy Boys books - there were never any demon things, mind you, but there's something in the composition and especially in the faces. I think I have to take a point off for that. Otherwise it's more or less what I'd expect from Cat Staggs.